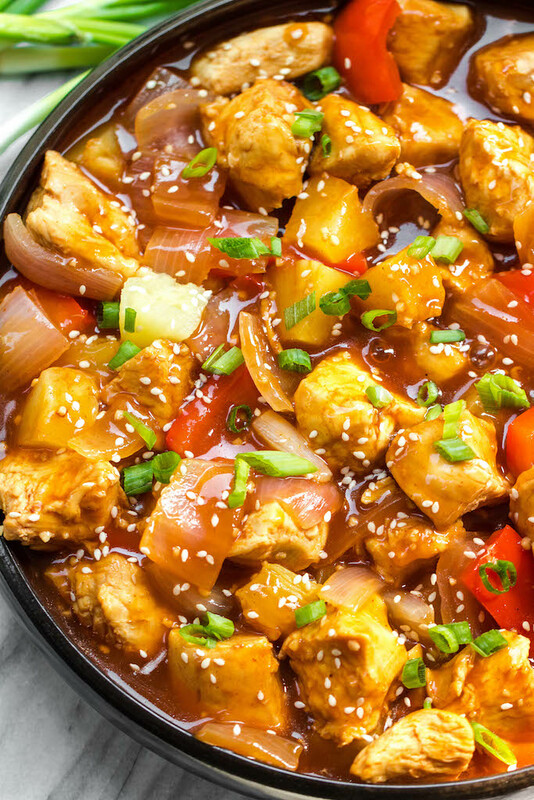 Whole30 instant pot sweet and sour chicken is so easy and so quick to make. It’s completely Paleo, sugar free, gluten free, and made in less 30 minutes. 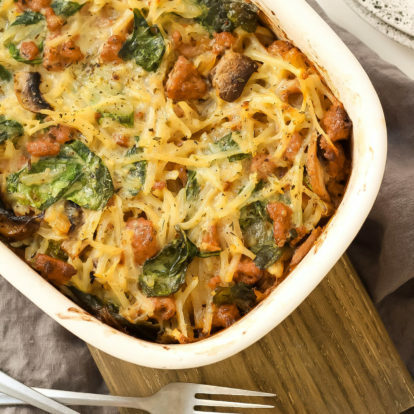 The simplicity of this recipe makes it perfect for a weeknight meal that’s family friendly, or for Whole30 meal prep. 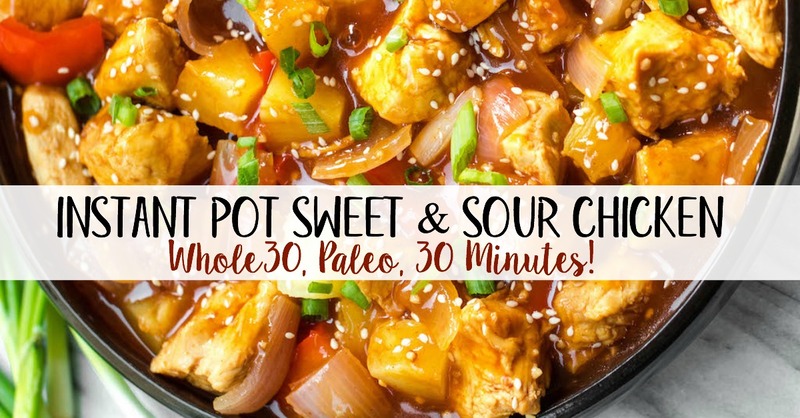 The sweet and sour sauce is made from pretty standard paleo ingredients and is a great alternative to Chinese takeout! This post is in partnership with Primal Kitchen. They’re giving you 10% off any of their products using the code “PALEOBAILEY” at checkout! I’m happy to work with a company I love, use and believe in so much. Thanks for your support here on the blog and your support for Primal Kitchen! If you don’t have an instant pot, don’t worry! I’ve included skillet instructions here too. However, if you don’t have one yet, what the heck are ya doing?! They’re so convenient! At first I didn’t know when I’d ever need to use it, but now it rarely leaves my countertop. I love that you can do so much in one pot, like searing the chicken, and making this sauce for example! No extra dishes needed. 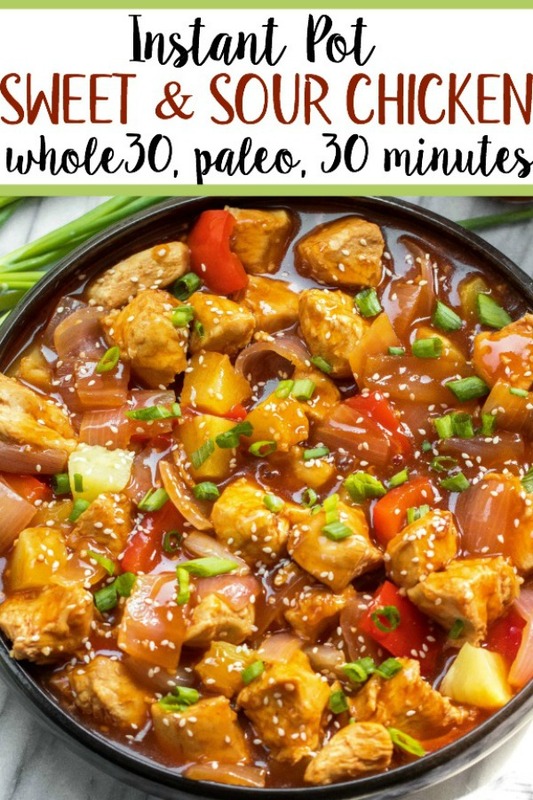 The Whole30 instant pot sweet and sour chicken sauce is made from a combination of pineapple juice from the canned pineapple, coconut aminos, vinegar and Primal Kitchen’s Whole30 Approved ketchup. What I love about this ketchup is that it doesn’t use any sort of sweetener but still has the consistency and flavor of common ketchups, making it perfect for the obvious purpose of dipping fries, adding to burgers, etc. But also as a Whole30 swap for Asian flavors like in this sauce! Even my boyfriend now prefers Primal Kitchen’s ketchup to his standard grocery store one and says that now he can’t stand the taste of the other one because it tastes so “chemical-y” when compared. Primal Kitchen already had the best dressings and marinades, but now they’ve totally stepped it up with the new ketchup addition! You can find these new condiments from Primal Kitchen on their website, or exclusively at Whole Foods! 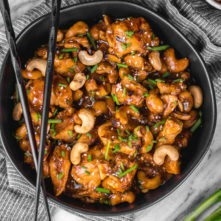 I also used a red pepper here for the Whole30 instant pot sweet and sour chicken, but a green pepper would work just fine as well. 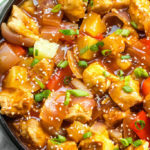 I think this would also be great with chicken thighs instead of chicken breasts, and I’m a big fan of using what you have on hand to make it work! The one thing to note about the veggies is that you don’t want to chop them too small. Keep them at a 2 inch to 1.5 inch chop so that they don’t get mushy in the instant pot, and so you get that Chinese dish feel to it with the larger chunks of veggies. 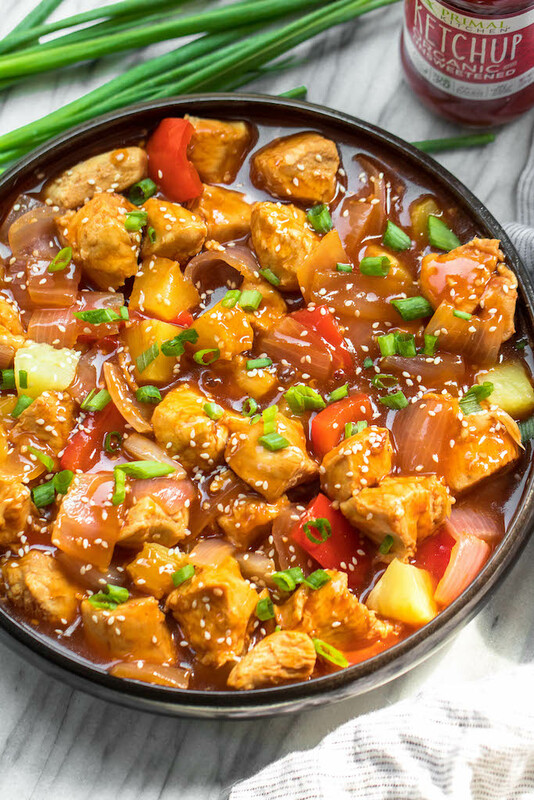 Whole30 instant pot sweet and sour chicken is so easy and so quick to make. 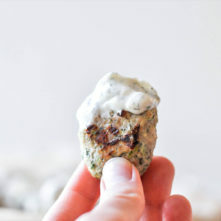 It’s completely Paleo, sugar free, gluten free, and made in less 30 minutes. 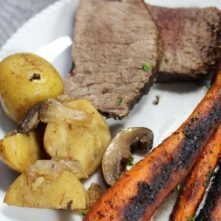 The simplicity of this recipe makes it perfect for a weeknight meal that’s family friendly, or for Whole30 meal prep. Sauce will begin to thicken, keep stirring for about 2 minutes and once the simmer slows to a slow rolling bubble, sauce is done. Pour sauce over the chicken and vegetables, add sesame seeds, green onions or cilantro to preference and serve with cauliflower rice! Add sesame oil to a large rimmed skillet on medium-high heat. Once hot, add chicken and sear on both sides about 2 minutes per side. Then, add in the onions, peppers and pineapple. Stir to combine and let cook for about 3 minutes. Combine all sauce ingredients except for the arrowroot and water in a small bowl, and then pour mixture into the skillet. Stir to combine, bring to a simmer and then reduce heat to medium and then cook for 10-15 minutes. Once chicken is cooked through, remove chicken and vegetables with a slotted spoon leaving just the liquid in the skillet. Mix arrowroot flour and water in a small dish until arrowroot is dissolved and then pour into the remaining liquid. Bring the liquid to a simmer once again, stirring often. 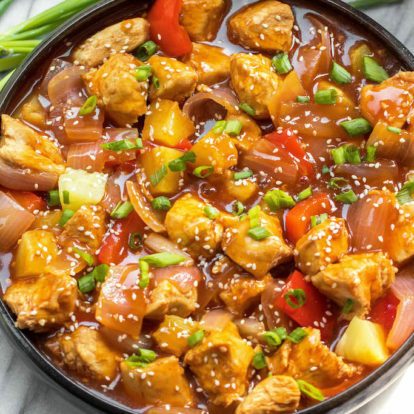 Sauce will begin to thicken and once the simmer slows to a rolling bubble, either add the chicken and veggies back into the skillet to coat with the sauce, or pour sauce over the chicken and veggies! 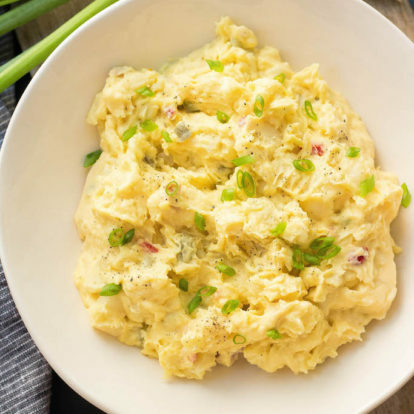 Garnish with sesame seeds, green onions or cilantro, serve over cauliflower rice and enjoy! 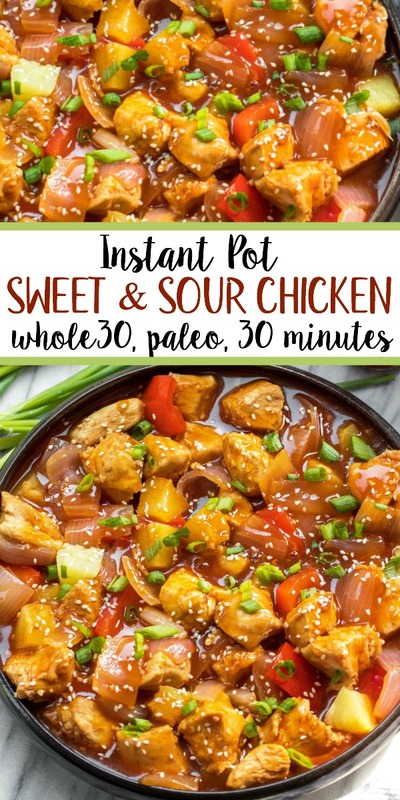 This Whole30 instant pot sweet and sour chicken post may contain some links that are affiliate links, though products are ones I use personally and recommend. 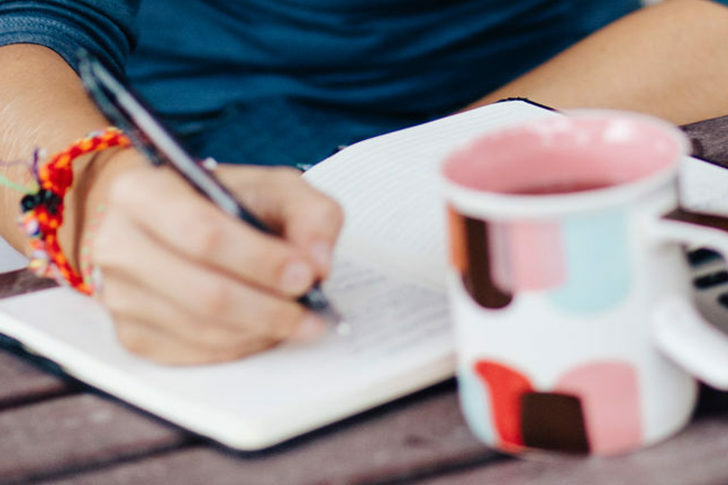 When you purchase anything using my links, it costs you absolutely nothing extra, but it does give wholekitchensink.com a little financial support which helps to keep this blog running. Thank you for your continued support, both with your dollars and your interest. I saw you make this on your Instagram stories and picked up a bottle of primal ketchup and 5 spice the next day at Whole Foods. Made this recipe 2x already! My kids love it! My husband didn’t know it was healthy! 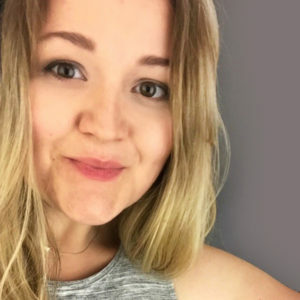 Krissy I am SO glad to hear this, and so happy it was a hit with your family. Thank you so much for letting me know! I am buying stock in primal kitchen now ever since I tried the ketchup at your recommendation. 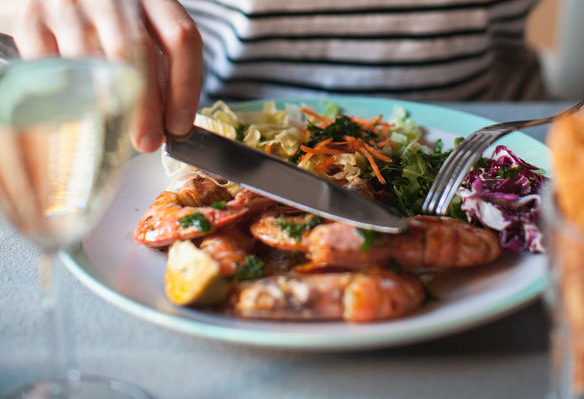 Blows any other paleo ketchup out of the water and in this recipe? Oh my goodness. Well, I’ll just say not all heros wear capes, bailey…. Ahhhh! Thank you! You made my day!! This is THE BEST thing I’ve made in all 27 days of my whole30. Thank you for this amazing recipe! I made this for dinner! It was fantastic! Plus I even got a thumbs up from my paleo skeptical husband! Thank you!! Followed the recipe to a T the first time and my family freaked out. ITS SO GOOD! Second time I doubled it in the IP and again… it’s SO GOOD. Thank you for making this incredible (easy) meal!!!! Wow wow wow I’ve never seen my husband and sons eat a Whole30 meal this fast. Thank you!! I have a question about the rice vinegar… Is it whole 30 compliant since its made from rice? Making this for a third time in less than a month! I love your recipes. Thank you for creating such easy and tasty meals!! Gosh this is a great recipe. Finished eating a few hours ago and still honestly just kind of shocked at how delicious it was!! I’m already craving it again i think. Thank you! I made this last night for the first time in my new Instant Pot. the sauce was awesome but my chicken was tough. What did I do wrong??? Hey there! So my guess would be one of two things! Either the chicken was diced into pieces smaller than the chunks I used/called for which would make them cook faster and be tougher. Or, the chicken was overcooked when doing the quick sear. If the chicken left longer than needed during that step, then the chicken would have already been partially cooked prior to starting the pressure cook time. Without having further info or being there with ya those are the only things I could think of 🙂 I’m sorry about that! I haven’t heard anyone running into that but please let me know if there’s anything else I can do to help! Yum!! Delicious and easy!! Once again an amazing go-to recipe!! Thanks! You’re so welcome! 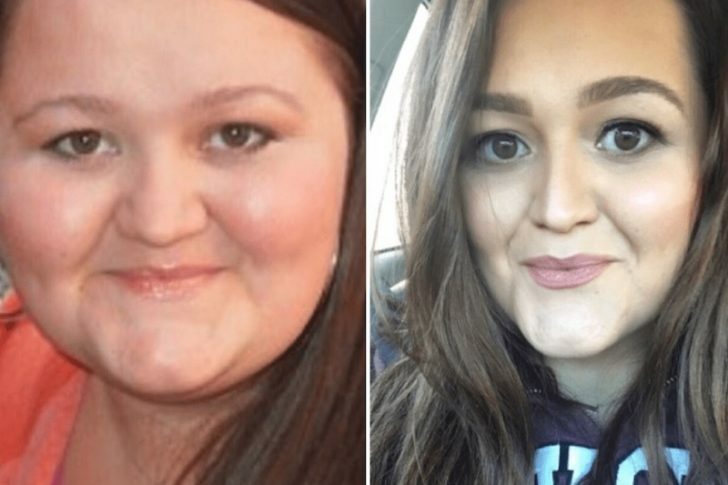 Thanks Jessica – so glad you enjoyed it!! What would be an arrowroot sub? excited to try this! Does anyone have the calories, etc. per serving? Hey Kevin! I don’t calculate macro info, but you’re welcome to use My Fitness Pal or whatever nutritional calculator you use for your meals! Do you think I could use fresh pineapple chunks and the. Just buy some 100% juice pineapple juice for the juice part of the recipe? I have a pineapple on my counter waiting to be cut! This was so good and so easy. I will be making this again and agin. Thank you! Thank you Donna!! I’m so glad you loved it! Do you think you could use frozen chicken strips for this and just bump up the cook time in the instant pot? Delicious! We enjoyed this simple, scrumptious dish. Everything cooked up perfectly. Thrilled to hear it, Linda! Thank you so much!! Hi Bailey! I made this last night, and we really enjoyed it! Just a quick question – the red pepper I used didn’t stay crunchy, it got really soft (almost squishy) and all the pieces sort of collapsed into themselves. Is that normal? Could I be doing something different so they hold their shape a bit better? Thanks so much! Hi there! My guess is that they were maybe chopped a bit too small. I usually leave them in larger chunks. However, another option would be to add them at the very end when you’re thickening the sauce. They’d stay fork tender then if they were smaller pieces! We loved this recipe! It took me longer than 25 minutes to make, but it was delicious! We especially enjoyed the garnish of sesame seeds and green onions. Thank you for the recipe! So glad you enjoyed it!! Thank you! 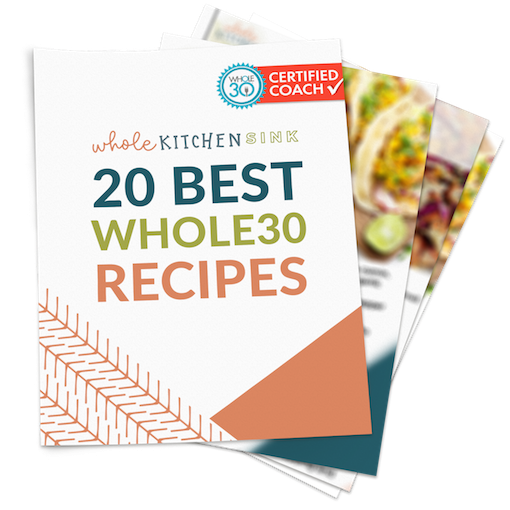 Our best whole 30 meal! Thank you for sharing!! Absolutely delicious!!!!! 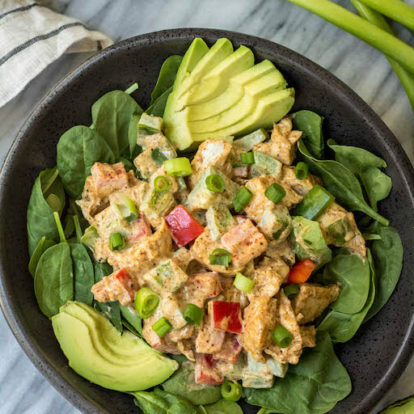 I began my 2nd attempt at Whole30 this month and just had to try this recipe! It is amazing and seriously tastes just like take-out! ???? Amazing!! Thank you so much – I’m so happy to hear you loved it! 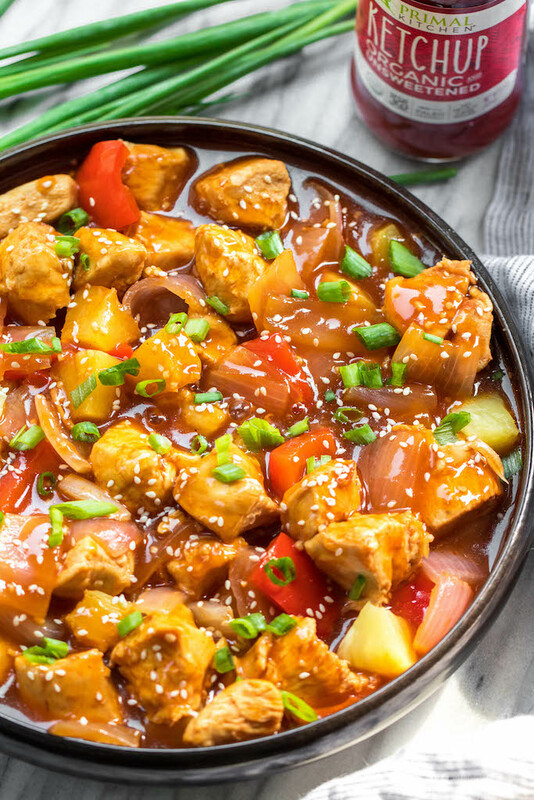 Literally better than takeout sweet and sour chicken. Loved this and it was so easy to make. Woo! Thank you so much Danielle! !